Belarus Digest starts to publish regular summaries of the most notable political and civil society news in Belarus. 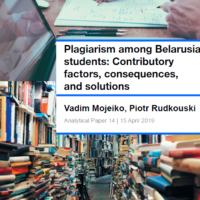 The new digests will attempt to give a richer picture of the recent events in Belarus, and will often go beyond the hot stories already available in other English-language media. Over the last weeks the news about mass protests and subsequent repressions dominated the headlines. Other notable events include the ongoing eviction of one the largest Belarusian opposition party from its headquarters (picture on the left) and trials against journalists and bloggers. The most interesting civil society news include creation of the online civil society archive and a public procurement seminar conducted with the Minsitry of Labour. The protests at the border. On June 12th at a checkpoint "Bruzgi" on the Belarusian-Polish border a protest against the restrictions of motor fuel’s removal from the country was held. 200-300 people took part in the rally. Special Forces from Hrodna were called to place of protest, they used tear gas. According to police, 22 people were detained. 15 of them were sentenced to fines of Br1.05 million (approx. $210) each. Video from the protest action here. On June 13 a similar protest took place at the border checkpoint "Warsaw Bridge" in Brest, which was attended by more than 50 people. “Revolution through a social network”. On June 15 and 22 the actions "Revolution through a social network" continued. The idea is to gather democratically oriented ppl weekly at a certain time (Wednesday, 7 pm) on the main square of the cities, without flags and other symbols. The action is called as "network revolution" (the idea of action appeared in the social network Vkontakte), "silent revolution" (the protesters do not submit any claims), "revolution of applause" (during the actions participants respond only with applause). On June 15 in Minsk one-two thousand ppl came to the action. Hundreds of people took the central squares in all regional centers and more than 10 district cities all over Belarus. Oktyabrskaya Square in Minsk was blocked with turnstiles and closed for the people. Photos and video here. Police detained more than 240 ppl, all were released without being drawn up. In Gomel, a “revolutionary” was fined Br770 000 (approx. $150). The amount of fine was collected by the Gomel residents. On June 22 the action was held in Minsk (up to four thousand participants), all regional centers and more than 40 district cities. Almost all the central squares of major cities were occupied by official events, fenced with turnstiles and limited to access. Photos and video here. According to Viasna, during a protest around 460 people have been detained, including 19 journalists. The next day, 22 people were fined from Br70 thousand to Br1.05 million (from $14 to $200 at the official exchange rate). All were charged under the administrative Article 17.1 “petty hooliganism”. Procurator against a blogger. General Prosecutor's Office opened a criminal investigation on the case of the national flag’s abuse in the blog Lipkovich.livejournal.com. It is assumed that the page belongs to the well-known blogger Evgeny Lipkovich. Earlier Lipkovich Blog was blocked for public authorities for "spreading information of disruptive nature". The trial on Poczobut is held in a closed format. The trial on the criminal case against the journalist of Gazeta Wyborcza Andrey Poczobut is held in Grodno behind closed doors. Poczobut is charged under two articles of the Criminal Code: 368 ("insulting the President") and 367 (slander against the president"). Participation in the trial is not allowed even to his family and foreign diplomats. BPF’s eviction is a final decision. On June 21 the College of Minsk Economic Court upheld the decision of the court regarding eviction of the Belarusian Popular Front, one of the largest opposition parties. The decision came into effect from the date of publication. BPF rented its office in the center of Minsk for 20 years. Now BPF activists refuse to release the premises and organized around the clock in the office. New public opinion poll. According to a recent survey of the Independent Institute for Sociological and Political Studies (May 2011), 33% of the adult population in Belarus received information from the Internet, while only 2.2% – from social networks. Prokopovich no longer heads the National Bank. On June 20 Prokopovich’s former deputy head Yuri Alymov was appointed the Acting Chairman of the National Bank. "Piotr Petrovich will not return to the National Bank. 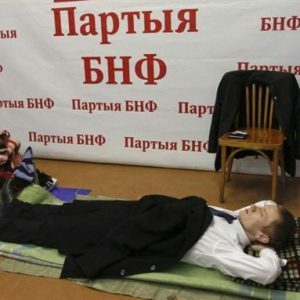 I want him to live,"- Lukashenka said. Blackmail against the Hungarian Ambassador. On June 8 a video clip was posted on Youtube, compromising the Hungarian Ambassador in Minsk Ferenc Kontra. According to Hungarian media, the fabrication of blackmail was done by the Belarusian KGB, who avenges the Hungarian diplomacy for its consistent criticism of the Belarusian regime. State-certified consultants on social contracting. From June 14 a training course for the second group of consultants on the specialty "State social contracting in social services" has started. This is a long-term training course, implemented by the efforts of the National Institute for Advanced Studies and Retraining of the Ministry of Labour and Social Affairs, Minsk International Education Center and NGO "ACT". At the end of May 2011 the first 15 people became state-certified consultants. Belarusian civil society’s web archive. On June 6 in Minsk, a public Web archive "Vytoki" (Origins) was presented. For the first time a unique archive on the history of the development of Belarusian civil society and the liberation movement during the last half century was created. This is a joint initiative of Human Rights Center "Viasna", Dyaryush, the NGO Assembly and Center Supolnasc’. This digest was prepared by Belarus Digest the basis of materials provided by Pact. Reading Belarusian news these days feels like opening a German newspaper on April fool’s Day. Some of the news just cannot be true – they must be jokes. But, up to now, not a single of that news has proved to be a hoax. An observer from the West is used to economic decisions being taken with a cold, sweat and tears. In any case, decisions are made after consultations with economists and discussions in parliaments and television shows. This is why it is difficult for a Westerner to understand declarations of the Belarusian president. In fact, he will be utterly alarmed by them, even if he is not an economist. We discuss the most striking recent decisions and declarations aimed at resolving economic crisis in Belarus. According to the Health Minister Vasil Zharko, all medical institutions must obtain an appropriate license from the National Bank before 1 July. Foreign students at Belarusian institutions of higher learning will also have to pay foreign currency for medical services. This is presented as a major measure to combat the crises. While Belarus understandably needs to take measures to attract foreign currency, in reality this measure will have almost no effect. First, according to Zharko, in 2010 medical assistance was provided to 98,000 foreigners, 80 percent of whom were Russian citizens. Most of the patients were Russians living in Belarus on a residence permit. Most of them do not have any access to foreign currency just like Belarusians. And what about the foreign students? Are the mainly Chinese, Uzbek and Turkmen students supposed to pay in Dollar and Euro or in their national currencies? Will private clinics and the Belarusian economy be happy to deal with Yen, Sum and Manat? The amount of currency inflow will remain very limited – Belarus is not a primary destination for Westerners to obtain expensive medical treatment. This rule was introduced by a joint resolution of the government and the National Bank of Belarus. Foreign drivers (except for those with Russian plates) will only be able to pay in dollars, Euros, and Russian rubles when filling their cars on major motorways and in border areas. In the past, foreigners were supposed to pay in foreign currency only in border areas of Belarus. It is difficult to understand for somebody from the West why it should be possible to pay in Euros or Dollars at a petrol station somewhere in the East of Belarus, while the same person will be in deep trouble when trying to pay in Euro or Dollars at one of the markets in Minsk. It is even more difficult to understand it in the context of other measures, such as export restrictions, which clearly undermine the effort to bring in more foreign currency into the economy. 3. Belarus has banned the export of some goods beyond the borders of its Customs Union with Russia and Kazakhstan. The State Customs Committee explained that this was necessary to protect the Belarusian economy after currency devaluation triggered panic buying of nearly all goods across the country. The list of items temporarily barred from exporting includes refrigerators, gas stoves, and other household goods as well as cereals and pasta produced in Belarus. Although banning the export of Belarusian goods appears to contradict the aim to get foreign currency inflow into the country, it seems absolutely absurd to include Belarusian pasta of all things on the visa ban list. 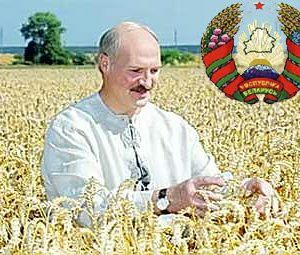 The lucky people who are living in the Western neighbor countries of Belarus certainly will not be so fond of the Belarusian-made pasta (with is of low quality even by objective standards) that come and will buy all the pasta stocks in the country? It is even more puzzling as export to Russian is still allowed without restrictions: most Belarusian food products are sold to Russia and not to the West. 4. Chinese experts have been reviewing Belarus economic policies for two weeks and concluded that Belarus' authorities are generally on the right track. The Chinese experts also reportedly thought that there was no need to follow IMF recommendations to liberalize the exchange rate. Experts from the Chinese central bank favored a greater administrative involvement in the foreign exchange market and a greater focus on exports. It seems that having Chinese experts was not a very good idea in the first place. China itself is struggling with inflation, and still they are giving Belarus a loan for purpose-bound projects. So it was a mere step of courtesy to invite the Chinese economists to have a look at the Belarusian economy – which is not at all comparable to the Chinese one. Everybody knows that China is one of the largest export economies in the world with large foreign investments. Belarus, on the other hand has a negative trade balance and negligible amounts of foreign investments. 5. Alyaksandr Lukashenka demanded Belarusian companies not to cooperate with investors who gave up their activities in Belarus because of the crises and raised a possible retaliation against Western companies in general. Belarus does not have the best reputation for treating foreign investors and such statements fail to contribute to their confidence. It will scare those who have courage to invest in the country despite the crisis. The investors' behavior appears reasonable from an economic point of view. Belarus authorities take many decisions in a populist fashion without any economic justification. Belarus officials, including Lukashenka, should consult economic experts who have a clear strategy before speaking about the economy. When most Belarusians no longer support the Belarus authorities, Western observers and investors are even less likely to do it.